At some point in your life, whether it was in the scouts or simply from an elderly relative you were given this dire warning in an effort to keep you away from a run-in with what most people simply call ivy. In other words, they wanted you to know that if you ran into a plant with clusters of three leaves, you had better leave it alone. Most likely it would either be poison ivy or oak. Both of these plants contain a poison known as urushiol. It is this poison that causes the characteristic itchy rash and weeping blisters, not to mention the sleepless nights as you sit up in bed scratching and ruing the day you came in contact with this scourge of the woods. 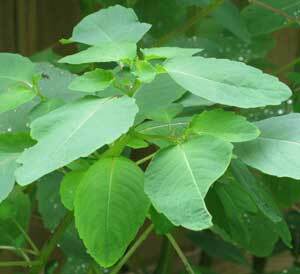 One other plant also containing urushiol is poison sumach, also known by some as thunderwood. You can guess why it is called thunderwood; one accidental meeting with this vicious plant and you will fully understand how it came by the nickname. It is however, not common except in very southern swamps and low areas. Most people will never see it unless they live within its more limited range. Both scarlet sumach and dwarf sumach which are not poisonous and are valuable medicinal plants closely resemble poison sumach and have been given the false reputation of being poisonous. 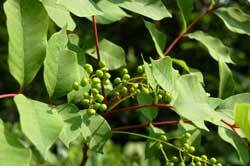 Approximately 85 percent of all American have some degree of sensitivity to ivy and sumach plants. Curiously, those people with ruddy complexions tend to not have problems with these plants. I have seen some people with this type of complexion grab a poison ivy vine with their bare hands and chop it down with no adverse effects. The average person would have ended up in the emergency room with horrific swelling. Most often you won't be aware that you have come into contact with ivy until about six to twelve hours when you begin to notice a slightly uncomfortable burning and itching sensation. As time goes by, the affected area reddens, blisters form, ooze puss and finally crust over and heal. All this time you are slowly going mad with the itching! 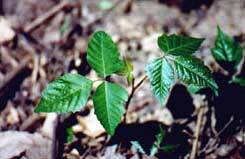 There have been many treatments used over the years for poison ivy and oak. You can go to the doctor and be put on medrol (steroid) pills, or for a severe outbreak be given a cortisone injection in the hip. The injection is the most effective and quickly reverses the itching and swelling. Herbal remedies which prove effective include oatmeal baths, poultices of mullein, baths in red oak ooze or white oak tea, plantain leaves and jewelweed. 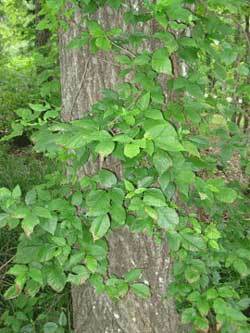 A popular Creek Indian remedy was to take American beech bark and nuts, boil them into a tea and soak. This remedy was adopted by early white settlers and remained popular for many years. In actual practice, the best two remedies to be found for an outbreak of ivy poisoning is the use of Jewelweed or Plantain leaves. Jewelweed, or Wild Impatiens is more well known for reversing an ivy outbreak. Its clear sticky sap is liberally smeared on the blisters with repeated applications being used until the outbreak clears. Sometimes it proves more effective if the blisters are first popped, though physicians warn against this as it can lead to possible infection. You be the judge as to whether you try this or not. Recently, a friend came to me covered in poison oak rash and two treatments with Jewelweed cleared it right up with just a little itching left. One problem with using Jewelweed is that immediately upon picking the plant, its chemical make-up begins to deteriorate and the plant has to be used fresh for best results. Making a tea and freezing it is about the best way to save Jewelweed for later use. Simply rub the affected area with a Jewelweed popsicle! A lesser known plant but one which is easier to find and use is common plantain. All varieties of plantain, which was brought to this country by the English as a food source can be used. This can be either the Lance-leaf Plantain or the Broad-leaved Plantain, two of the more common varieties found in the U.S. To use, simply make an decoction of the leaves and apply it to the ivy outbreak. You will be amazed at just how fast it works. An even better method is to take Plantain leaves and blend them into a pulpy mass using hot water and a food blender. Apply this to the rash and stand back in amazement at how fast it works. In fact, if you notice while out in the woods the slight burning sensation warning of contact with ivy, you can take some plantain leaves, crush them and apply to the ivy area to neutralize the poison before it has a chance to take effect. 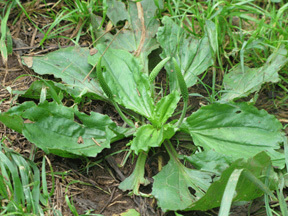 In my opinion and experience, a poultice of hot plantain leaves will work much faster and better than Jewelweed and is, hands down, my preferred herbal treatment for the outbreaks. If all else fails, coat the blisters with moustache wax. As long as the blisters stay sealed and don't come into contact with the air, they won't itch. Scalding the area with hot water will also relieve the itching for hours. This works by causing all of the histamines in the affected region to be released all at once. It is the histamine reaction which actually causing the sensation of itching. For up to six hours or more, until the histamines can reach a certain level, the itching will be greatly relieved or non-existent. It is amazing how well this treatment works. By familiarizing yourself with these plants, it is possible to avoid the problem in the first place. If you do find yourself in a thicket of ivy vines just remember that as long as you don't bruise the leaves or stems you can pretty much avoid an unpleasant experience.Don't forget that the poison remains viable for years and decades after the plant has died. It is possible to get a rash from plants which were cut down a hundred years ago. It is a potent poison! When you come in from a trip to the woods and suspect that you may have come in contact with ivy, wash your hands with water and detergent or alcohol. These are the best to use to break down the poisonous oil and keep them from soaking into the skin. The sooner you can wash off the urushiol the better. Did you know that poison ivy sap was used as ink at one time? In fact, the constitution of the United States which is written on Marijuana paper was done using ink made from poison ivy. Poison Ivy was also a valued medicine a hundred years ago. It was used in the treatment of herpes and skin rashes among other things. One last bit of folklore surrounding poison ivy and oak is the theory that by eating small quantities of the leaves in the spring gives one immunity from an outbreak for that year. While controversial, I have found this to be true for me. I am highly allergic to ivy but find that when I do this, I have no problems for the rest of the season. The way I was taught to do this was to get the small leaves when they were the size of a mouse's ear. Take three and place them in a piece of bread. Repeat this every three days for about three weeks and some degree of immunity is achieved. This simply goes back to the theory of immunization such as is used for small-pox, plague etc. In fact, if you go to an allergy doctor for poison ivy immunization, what do you think he is giving you in that injection? Again, this is a "use your own judgement" sort of decision only you can make. While we may fear poison ivy, poison oak and poison sumach, it is important to remember that they too have their place in the workings of nature. In the spring, the blooms are valuable sources of nectar and pollen for honey bees. During the fall and winter months the berries are important food sources for song birds and other small animals. Even itchy plants have their purpose. Grows as a shrub or vine. Usually it is found as a vine with a trunk as big as a mans arm. Leaf clusters are compose of three leaflets. The leaflets are very gently rounded with great variety of leaf shapes. Fruits are clusters of small berries which are grayish-brown; stem is rusty brown. Grows just about everywhere. It loves to climb trees but will climb fences, or simply sprawl along the ground. Resembles poison ivy but tends to grow as a shrub and sometimes as a small tree. Has the same three leaflets as poison ivy but they are more oak-like in appearance. Berries are hairy and yellow in color. Grows in many of the same areas as poison ivy but usually prefers drier locations such as pine thickets and rocky areas. It is more common on the east side of a mountain. Grows as a tall shrub and resembles Scarlet and Dwarf Sumach. Prefers swamps, ditch banks and other low-lying areas. Grows more commonly along the coastal plain and lower areas of the South. Has 7 to 13 leaflets per cluster with cream-colored berries growing out underneath the leaflets as opposed to other sumachs which have red berries growing at the terminal end of a branch. 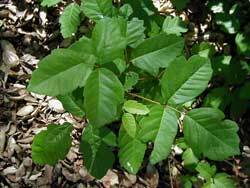 Has a much high urushiol content than does poison ivy or oak.